Soffia H. Kuehner Gray is a junior in Communication and French Studies at the University of Illinois. She is planning on attending law school and completing a Master’s degree in Communication. She wrote this blog text while enrolled in 418 ‘Language and Minorities in Europe’ in the spring of 2015. 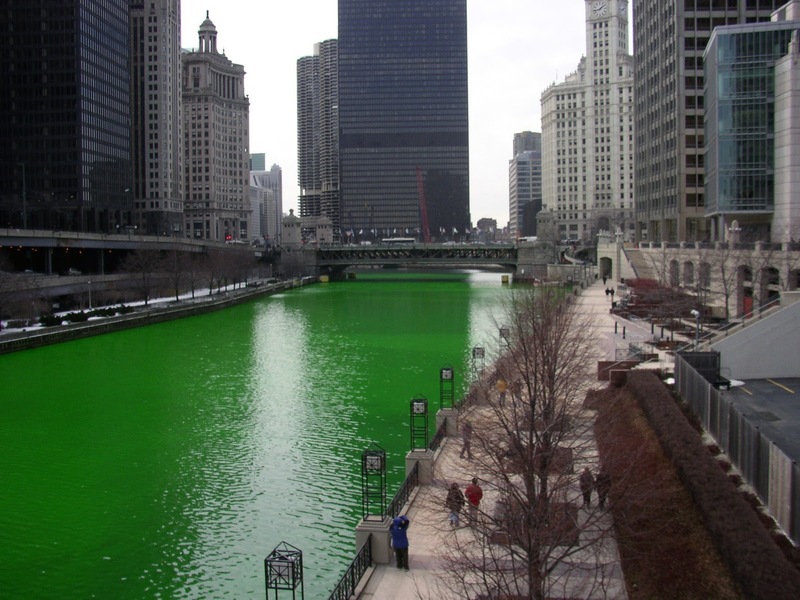 If you walk down the street of nearly any city in the United States during the month of March, chances are that you will encounter an array of shamrocks, leprechauns, and pots of gold all displayed in celebration of St. Patrick’s Day. Hundreds of thousands swarm to parades like the South Side Irish Parade in Chicago to honor their Irish heritage. Indeed, no matter the time of year, Claddagh rings, Aran sweaters, Guinness beer, and Irish tea are all readily available for purchase at local gift shops. While the trinkets and festivals that are a part of Irish culture are only increasing in popularity, the Irish language is decreasing in popularity. Once widely spoken, UNESCO has marked the Irish language as “definitely endangered.” Consequently, the Irish language is no longer learned as a first language within the Irish home (Moseley). It is extinct as a first language for residents of Northern Ireland, but it is still learned as a second language there as well as throughout the Republic of Ireland (Moseley). 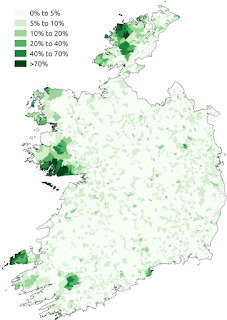 In fact, the use of the Irish language is primarily confined to the Gaeltacht– areas of Ireland in which at least 75% of the population speaks Irish. These boundaries are constantly being reevaluated every seven years (Comisiún Na Gaeltachta 10). In an effort to revitalize the language, Irish language immersion schools, or Gaelscoileanna, have been established throughout the Republic of Ireland and Northern Ireland (hereafter both referred to as Ireland). The first Gaelscoil was founded in Ireland in 1973 for the purpose of “establish[ing] and sustain[ing] a high standard of Irish…education…[and] to develop and strengthen the Irish speaking community and culture” (“Gaelscoileanna”). Both primary and post-primary Gaelscoileanna schools exist in each of the four provinces that comprise Ireland: Connacht, Leinster, Munster, and Ulster (“Schools”). There are currently 45,373 students enrolled in the Gaelscoileanna schools across Ireland (“Statistics”). These schools are freestanding units that are unaffiliated with other schools in Ireland. Each Gaelscoil is run by a board-of-management (Ó Baoill 413). In the Gaelscoileanna, classes are taught in Irish and, as a result, students enrolled in the schools become fluent in both Irish and English (“What is Immersion”). While these schools certainly prioritize the acquisition of the Irish language, it’s important to consider whether or not they are truly effective in the revitalization of the Irish language. Children enrolled in these immersion schools are certainly able to learn the Irish language. However, the access to these institutions is limited. In general, Irish immersion schools for children comprise less than 8% of primary schools (Parsons 493). Furthermore, it is difficult for the progress of students to be comprehensively tracked. For example, there is a “limited number of assessment measures available for Irish reading attainment,” while there are innumerable ways in which educators can measure students’ progress in English (Parsons 497). This underlines the fact that, while Irish is being taught as a primary language within the immersion school, Irish is still a minority language outside the school. Consequently, in order to effectively revitalize the Irish language, additional steps need to be taken to increase the number of speakers of Irish who use the language as a matter of course in their daily lives. However, while the Gaelscoileanna may not seem successful at first glance, it is important to understand that, without these institutions, there would be 45,373 children in Ireland that would go to school without being immersed in the Irish language on a daily basis. A language only survives if it is transmitted from generation to generation. A child can learn Irish. However, for the language to flourish and return to its original popularity, the language needs to be shared with the next generation. To reverse the endangerment of the Irish language, it needs to be spoken at home. The Irish language was once widely spoken in the home, and it would be beneficial for current speakers to emulate this practice that has now waned (Comisiún Na Gaeltachta 4). However, until such revitalization is realized, it is quite likely that the use of the Irish language will continue its decline. Coimisiún Na Gaeltachta. Report of the Gaeltacht Commission. Rep. N.p. : n.p., 2002. Print. "Gaelscoileanna." Gaelscoileanna – Irish Medium Education. Gaelscoileanna Teo, 2015. Web.24 Mar. 2015. Moseley, Christopher (ed.). 2010. Atlas of the World’s Languages in Danger, 3rd edn. Paris,UNESCO Publishing. Online version. ÓBaoill, Dónall P. "Origins Of Irish-Medium Education: The Dynamic Core Of LanguageRevitalisation In Northern Ireland." International Journal Of Bilingual Education &Bilingualism 10.4 (2007): 410-427. Academic Search Complete. Web. 24 Mar. 2015. Parsons, Christine, and Fiona Lyddy. "The Sequencing Of Formal Reading Instruction: ReadingDevelopment In Bilingual And English-Medium Schools In Ireland." InternationalJournal Of Bilingual Education & Bilingualism 12.5 (2009): 493-512. Academic SearchComplete. Web. 24 Mar. 2015. "Schools." Gaelscoileanna – Irish Medium Education. Gaelscoileanna Teo, 2015. Web. 24 Mar.2015. "Statistics." Gaelscoileanna – Irish Medium Education. Gaelscoileanna Teo, 2015. Web. 24 Mar.2015. "What is Immersion Education." Gaelscoileanna – Irish Medium Education. GaelscoileannaTeo, 2015. Web. 24 Mar. 2015.